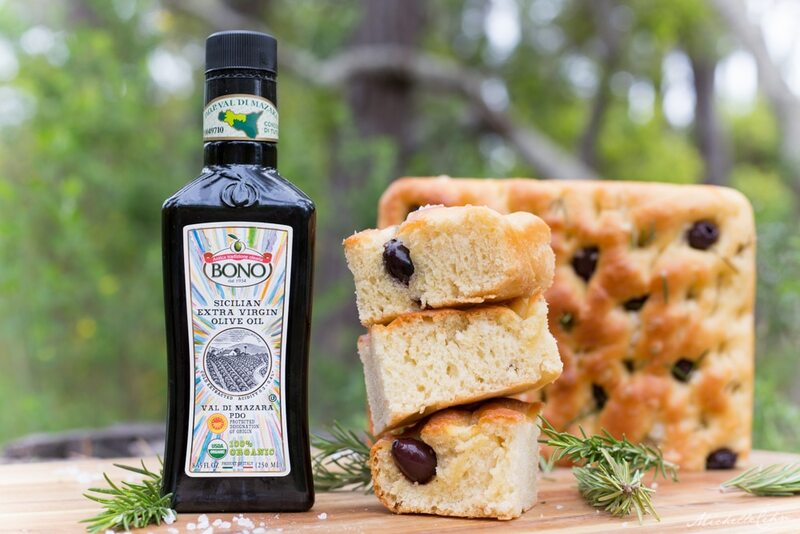 This delicious focaccia recipe was generously sponsored by my friends at Bono, makers of the delicious extra-virgin olive oil we used to make this bread. Enjoy! 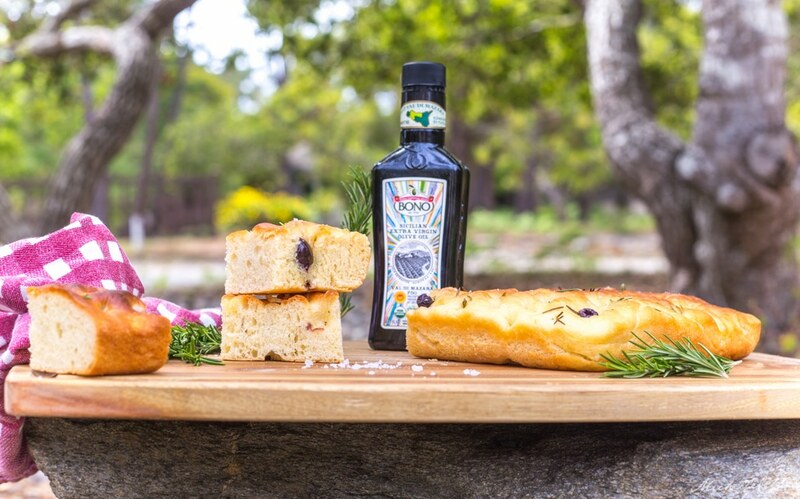 I’ve loved focaccia bread ever since I was a little girl. My mom used to take me to a local bakery that had shelves stocked full of all different varieties of fresh-baked bread. 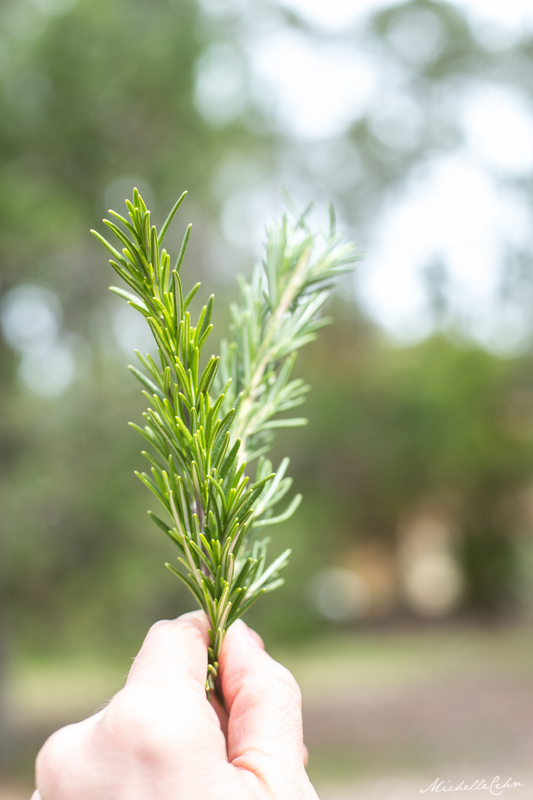 I’d always head straight for the pillowy rosemary-infused focaccia sprinkled with chunky sea salt. Fast-forward a few decades to today, and now I make my own focaccia bread from scratch at home! It’s a surprisingly easy endeavor. 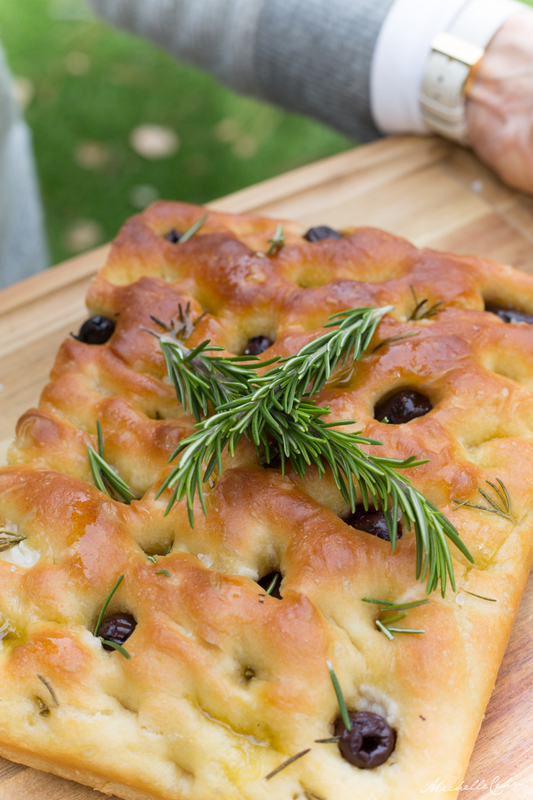 Focaccia can be made with just 6 base ingredients (plus any fun add-ins you desire). It takes a while as you have to let your dough rise (or “prove”) for a few hours, but the method is simple. And my-oh-my will it be worth the wait when you smell the aroma of freshly baked focaccia wafting through your home! 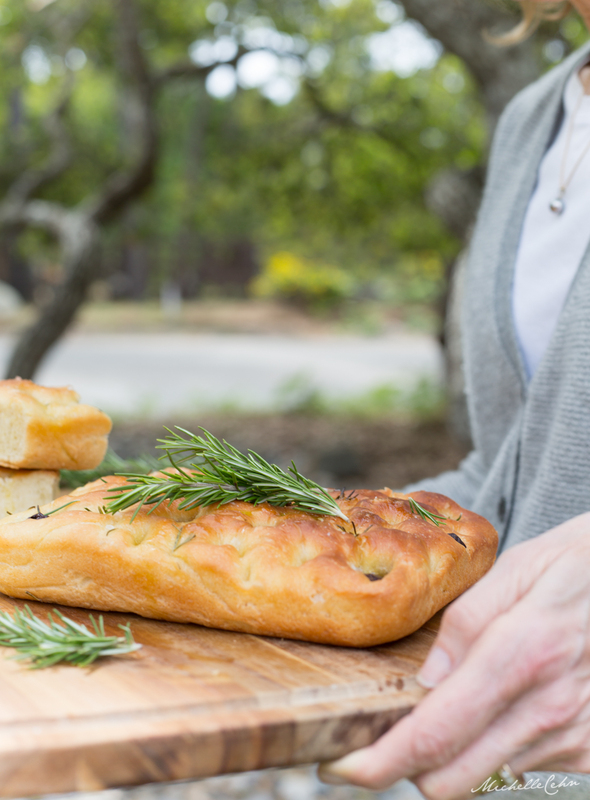 In this recipe, I’m going to share my favorite way to make focaccia. 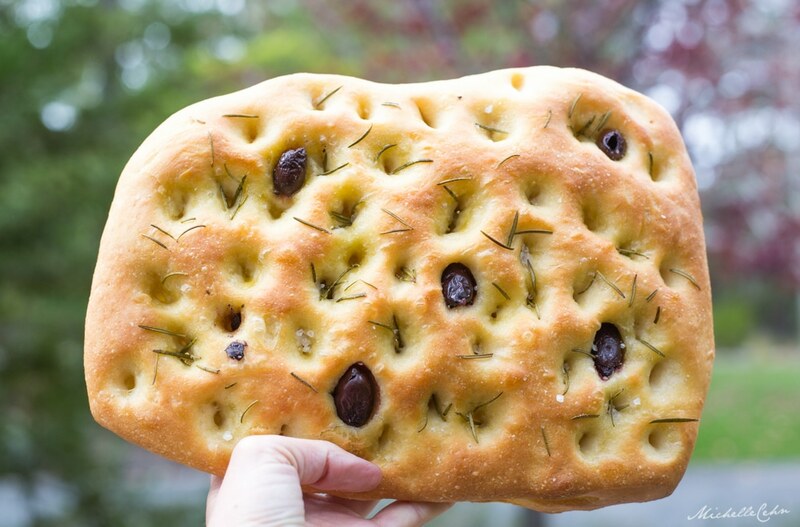 I love making focaccia with olives and fresh rosemary (my personal favorite combo!) but you can absolutely mix it up however you’d like by adding tomatoes, caramelized onions, garlic, red pepper flakes, or any number of other ingredients. 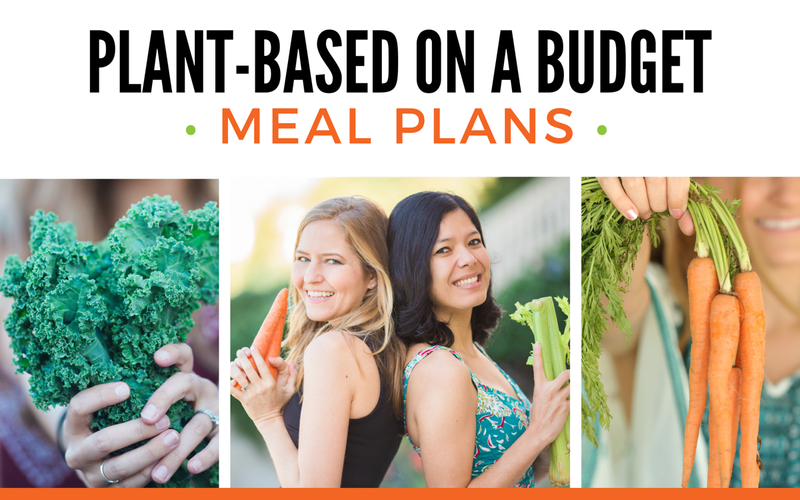 I’m including more ideas for you below. 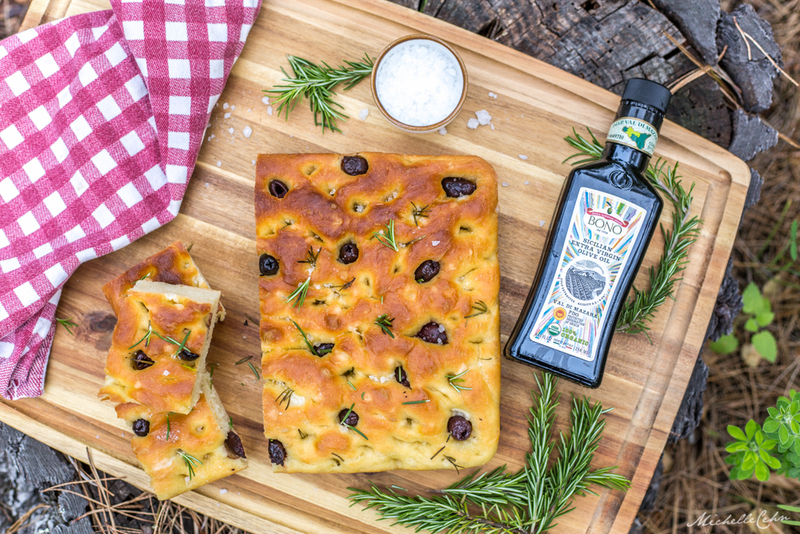 Tie up your apron and make yourself a batch of this delicious fresh-baked focaccia bread. Add warm water, sugar, and active dry yeast to a small bowl, stir, and allow to sit for 10 - 15 minutes. 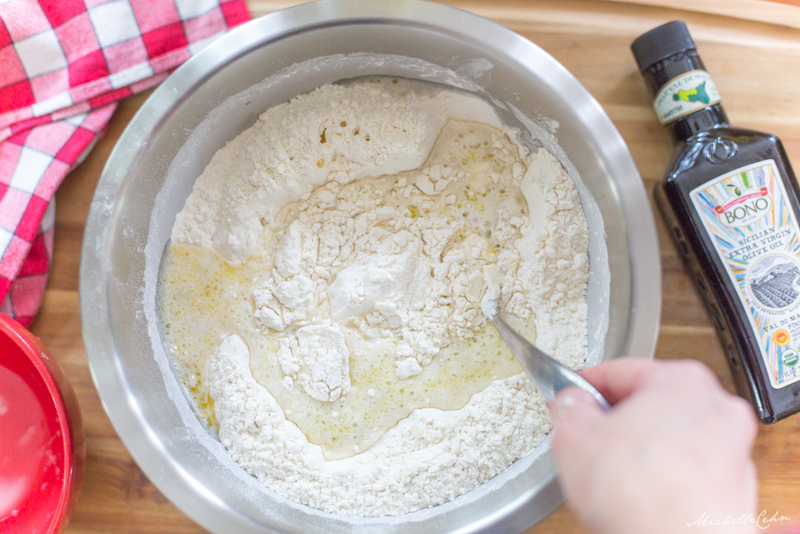 In a large mixing bowl, add the flour, salt, and wet yeast mixture, and mix together until a dough forms. Flip the dough out onto a lightly floured surface (such as a clean countertop), and knead for 5 - 10 minutes. Clean out the mixing bowl and coat the bowl lightly with oil. Place the ball of dough into the bowl, flipping to coat with oil. Cover the bowl with a damp cloth and allow to rise in a warm area (such as near the stove) for 1.5 hours, or until the dough doubles in size. 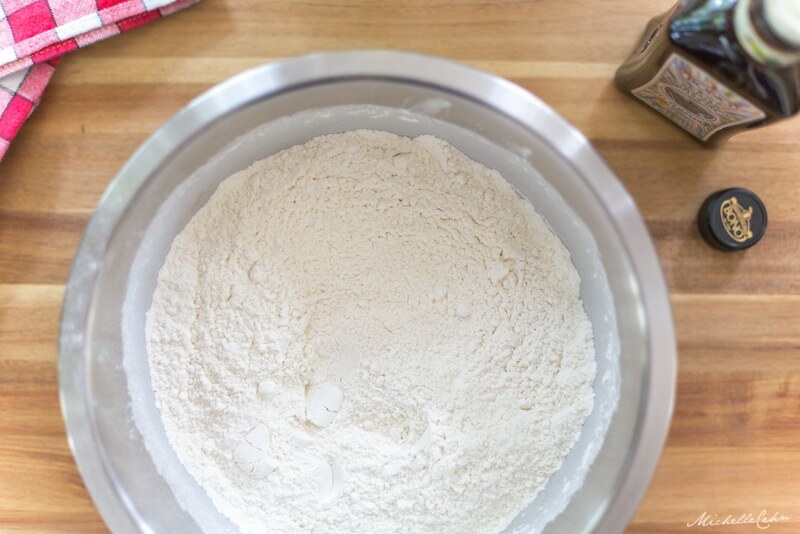 Place the risen dough back onto your lightly floured surface once more and very gently tumble it around to "knock the air out" before shaping the dough and placing it onto an oiled baking pan or baking dish. You have a few options for shaping your dough. You can spread the entire mass into a 7" x 11" baking dish (this will produce a thicker and very uniform rectangular focaccia). For a more rustic hand-formed focaccia, you can spread the dough onto a large baking sheet in one big mass or break it into two, three, or four mini-loaves. 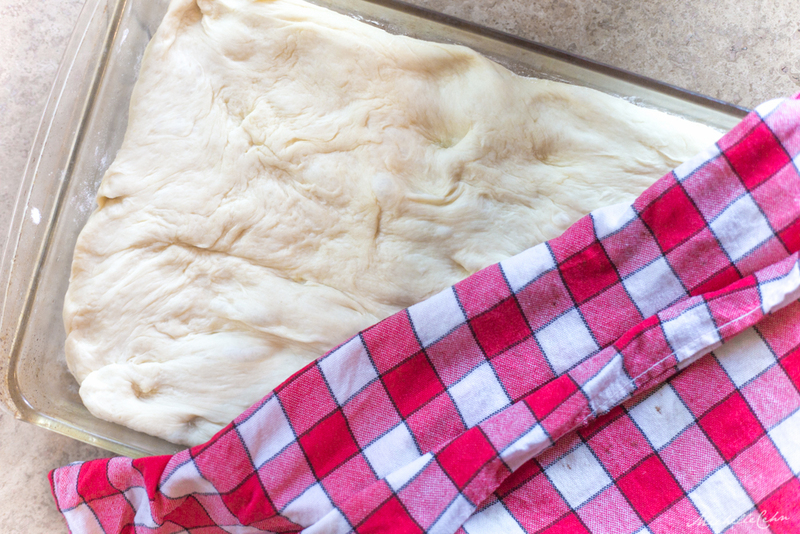 Once shaped on your oiled baking dish or pan, lightly coat the dough with oil, cover with a damp cloth or oiled plastic wrap, and leave to rise for another 30 minutes. 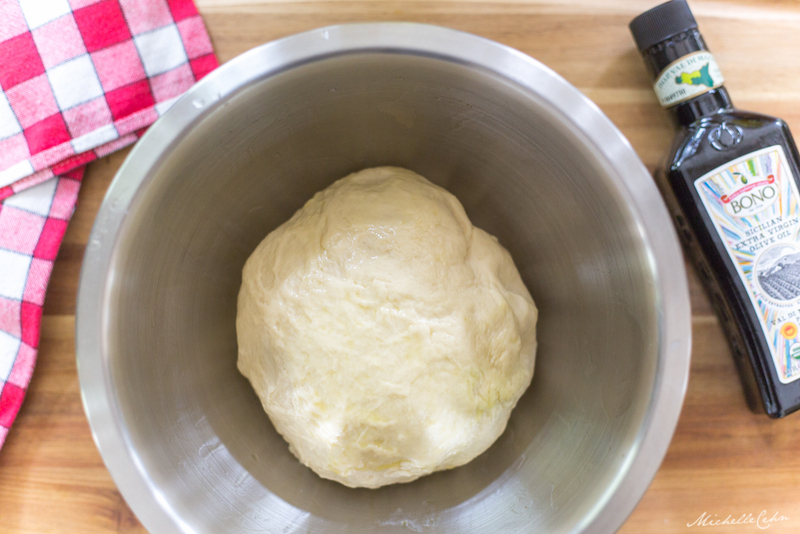 Remove the cloth or plastic wrap from the dough and add your toppings. Press the olives, fresh rosemary sprigs, and anything else you'd like to add deep into the dough. Using your finger, stab the rest of the dough to create the classic focaccia indents that will catch the oil. Push your fingers from the top of the dough straight down all the way through to the bottom. Continue across the entire surface until the full loaf is covered with finger indents spaced about an inch (or less) apart. 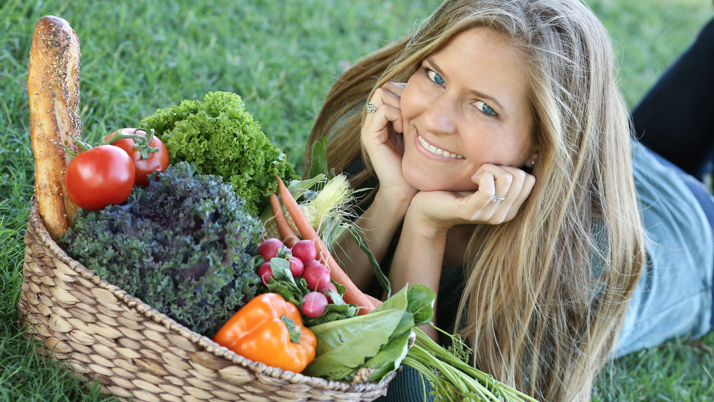 In a jar or container with a lid, add the 1/3 cup of olive oil and 1/3 cup of water and shake vigorously until combined. Pour this mixture on top of your dough (it will hang out in the finger indents you just made). Bake for 20 minutes until very lightly browned on top. Remove, sprinkle with chunky salt, and enjoy! If you love focaccia as much as I do, you’ll have lots of fun playing around with different varieties! You can even split the dough in two (or three or four) and make several different varieties in a single baking sesh. 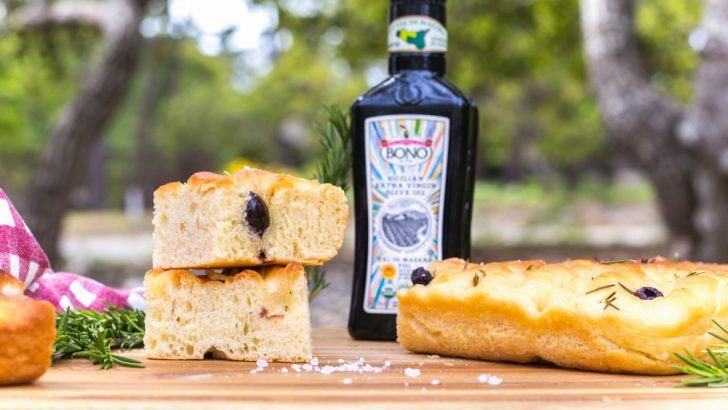 Focaccia gets much of its delicious flavor from olive oil, so it’s important to use a really high-quality extra virgin olive oil in this recipe. Extra virgin olive oil is made from pure cold-pressed olives. Other types of olive oil are lower-grade, refined, and can even be a blend of other processed oils. 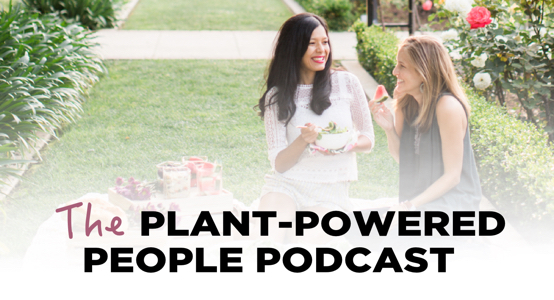 If you did an olive oil taste test you’d notice that olive oils that aren’t labeled “extra-virgin” are often lacking or completely void of flavor. I used this organic Sicilian extra virgin olive oil from Bono. Bono is a longstanding company that has been around since 1934 and runs the biggest oil mill in all of Sicily. Their olive oil is aromatic and rich in both color and flavor. If you’ve never had a high-quality Italian olive oil before, I highly recommend giving this a try! 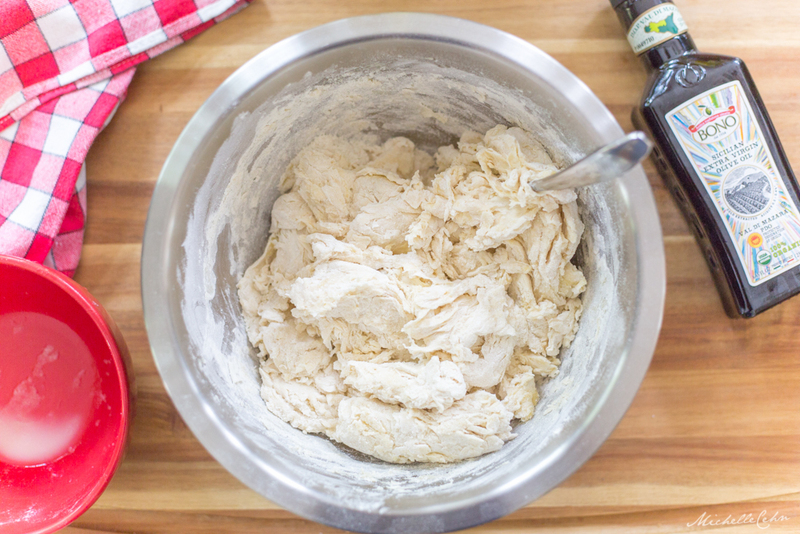 This recipe makes a dough that can be shaped in a number of different ways. Want one big uniform rectangular focaccia loaf? You can spread the dough into a large baking dish. I used one like this 7″ x 11″ Pyrex dish) which creates a thick focaccia (pictured above). Alternatively, you can shape the dough however you’d like on a large baking pan. You can make one giant loaf or split the dough into two, three, or four separate parts. Shape it to be round, oval, or oblong to look extra-rustic—the choice is yours! I whipped up another batch of focaccia today. I separated the dough into two parts and spread them into oblong ovals on an oiled baking pan. The result is pictured below! 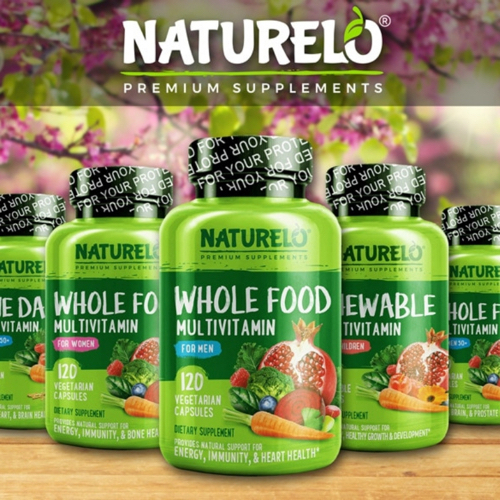 So…Ready to Give It A Go? Breadmaking is one of my favorite types of baking. If you give it a chance, I imagine it will quickly become one of yours too. The steps are simple, and it’s really fun seeing what some flour, yeast, and water can do when you help them work their magic. Making bread can be a test of patience, for sure, and takes some forethought and planning. But as soon as you fill your home with the smell of baked bread, you’ll be hooked. Might I recommend whipping up a batch the next time you want to make some happy memories with friends? After all, scent is the strongest sense tied to memory! I’ve been binge-watching The Great British Bake Off on Netflix with my hubby. Have you seen it? It’s addicting. And now I have quite the baking bug. I’ve baked more goodies over the past 6 months than I ever have in my life. I now love the process of testing and perfecting recipes. And when they get really good, then I get to share them with you! Photos by Michelle Cehn. 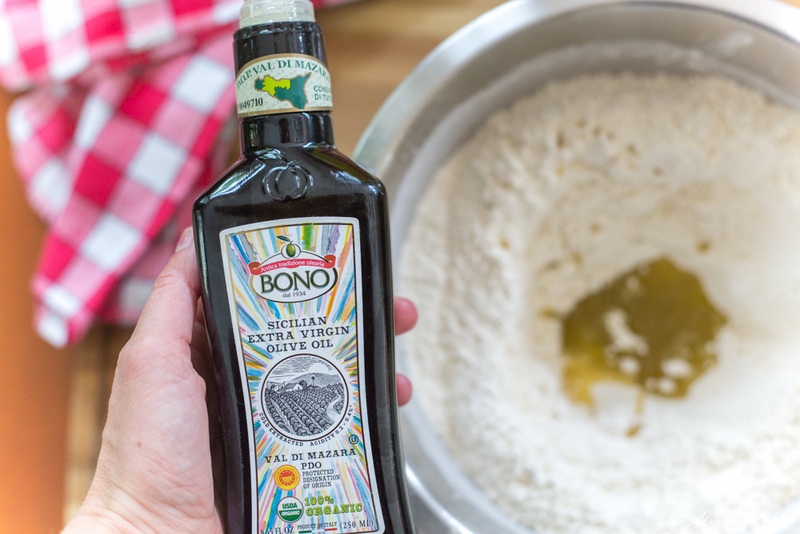 Many thanks to Bono olive oil for generously supporting our work here at World of Vegan!